Just like an email account WordPress blogs are subjected to spam in the form of unrelated and unwanted comments from people trying to get a link to their site. These comments are usually written very generally so they look genuine on every site. I’ve rejected them all because they had nothing related to the subject of the post or this blog in general. I would love to receive comments about this site. However, please make sure that your comments clearly pertain to ham radio or the post/page your commenting on. Your specificity will help me separate your comment from spam. The picture below shows input to get an azimuthal map for Colombo Sri Lanka. 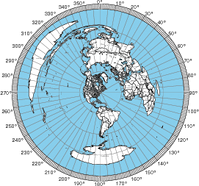 Thank you for providing the Azimuth map program that centers my qth on it. Very cool !!! !